Cheney replied that the conviction for obstruction of justice was based on what amounted to a case of "he said, he said," a disagreement between his longtime aide and a journalist. Libby had told the grand jury he remembered first hearing Plame's name from NBC's Tim Russert. But notes obtained by prosecutors indicated that Cheney had been the first to identify her to Libby. And Russert denied at Libby's trial that he had mentioned Plame to the defendant. The jury sided with Russert. Cheney, however, considered it an open question. "Who do you believe, Scooter or Russert?" he asked Bush. And Cheney went further. Even if Russert was right, Libby may have honestly forgotten what was said during a single conversation in a typically busy day. Memories are fallible. Only an overzealous prosecutor and a liberal Washington jury would criminalize a bad one, he argued. For his part, Fielding laid out most of his findings in a document called the pardon book, a compendium of evidence for anyone seeking clemency. The book on Libby lengthened the odds on a pardon. "You might disagree with the fact that the case had been brought and that prosecutorial discretion had been used in this way," says a source familiar with the review. "But the question of whether there had been materially misleading statements made by Scooter--on the facts, on the evidence, it was pretty clear." As far as Fielding was concerned, Libby had lied under oath. And then there was the commutation of 2007. Fielding told Bush that justice had been done in commuting Libby's harsh sentence nearly two years before. Bush had no moral obligation to do more. "You've done enough," he told the President. Presidential counselor Ed Gillespie, without passing judgment on the legal merits, told Bush a pardon would have political costs: it would be seen as an about-face or a sign that he hadn't been forthright two years earlier in declaring that a commutation was the fairest result. Bush would decide alone. In private, he was bothered by Libby's lack of repentance. But he seemed more riveted by the central issue of the trial: truthfulness. Did Libby lie to prosecutors? The President had been told by private lawyers in the case that Libby never should have testified before the grand jury and instead should have invoked his Fifth Amendment right not to incriminate himself. Prosecutors can accept that. But lie to them, and it gets personal. 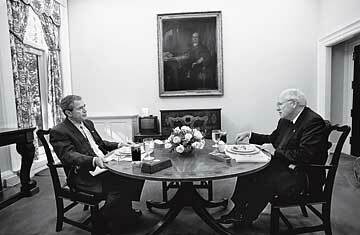 "It's the difference between making mistakes, which everybody does, and making up a story," a lawyer told Bush. "That is a sin that prosecutors are not going to forgive." A few days later, about a week before they would become private citizens, Bush pulled Cheney aside after a morning meeting and told him there would be no pardon. Cheney looked stricken. Most officials respond to a presidential rebuff with a polite thanks for considering the request in the first place. But Cheney, an observer says, "expressed his disappointment and disagreement with the decision ... He didn't take it well."